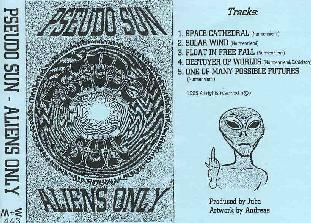 Pseudo Sun - "Aliens Only"
Pseudo Sun's follow up to last year's debut CD, "Future Memoirs", is a 5-song cassette release. Pseudo Sun frontman Juba Numenniemi (former darXtar) handles the vocals, bass, synthesizers, guitars, and drums, only calling in help with drums on one track and guitar on two tracks. On Aliens Only, Juba seems to experimenting more with electronic atmospherics. This is a far more laid back affair than the metallic crunch of Future Memoirs. "Space Cathedral" is a short synth intro that leads into this set's only real rocker, "Solar Wind". Solar Wind is a bluesy space rocker that sounds like a drugged out 60's power trio jam rock tune. It's got a nice slow going but great feeling solo that is embellished by the swirling space synths. Very cool. "Float In Free Fall" is an ambient psychedelic marching tune that seems like the most extended of the five tracks. "Destroyer Of Worlds" is another laid back spacerock tune much along the lines of "The Time Traveller" from Future Memoirs. And "One Of Many Possible Futures" is a mostly ambient electronic piece. I really liked Future Memoirs and Aliens Only is a little something to tide us over until the next full length release, "Atomic Dogs Don't Bark".